OtterBox announces a full lineup of cases for Galaxy Note8. Commuter Series is available now on otterbox.com. FORT COLLINS, Colo., Aug. 23, 2017 /PRNewswire/ -- Take note: the new Samsung Galaxy Note8 is feature-packed, giving you so many reasons to protect it from bumps and drops. OtterBox offers a full lineup of premium cases for Galaxy Note8, available now. From rugged to stylish, OtterBox cases guard Galaxy Note8 from drops, dings and other mishaps, while Alpha Glass screen protectors guard the curved display against scratches.1 Each case design is subjected to 24 or more tests across more than 238 testing hours, earning the OtterBox Certified Drop+ Protection seal. OtterBox cases wrap Galaxy Note8 in a variety of stylish designs that allow access to every feature and function, including dual back cameras, Bixby voice capabilities and Infinity Display. Each case design is compatible with the Galaxy Note8 S Pen, keeping it tucked away safely when not in use. Symmetry Series and Symmetry Series Clear slip Galaxy Note8 into a slim, stylish, single-piece case that stands out in a crowd with bright colors, clear case back or clear graphics. The dual-material construction helps guard Galaxy Note8 against drops, while a raised, beveled edge provides a buffer for front-facing falls. Commuter Series is a dual-layer case that covers Galaxy Note8 with on-the-go protection. The slim Galaxy Note8 case easily slips in and out of pockets, helps guard against bumps and shock with a tough shell and blocks out lint and grime with a shock-absorbing slipcover. Defender Series boasts a screenless, multi-layer design that sets the standard for durable, long-lasting protection and is fully compatible with the curved screen of Galaxy Note8. A rigid shell with a foam liner cradles the device during drops, while a tough, textured outer slipcover absorbs shock and blocks out dust, dirt, lint and grime. Pair any OtterBox case with Alpha Glass screen protectors to keep Galaxy Note8's edged display brilliant. The fortified, anti-shatter glass protects the display while reactive technology retains touchscreen sensitivity and iris scanning responsiveness. Symmetry Series, $49.95, Commuter Series, $49.95, and Defender Series, $59.95, for Galaxy Note8 are available now on otterbox.com and at select retailers. Alpha Glass, $44.95, is coming soon. To learn more, visit otterbox.com. At the center of every OtterBox innovation is a deeper goal to effect positive, lasting change. In partnership with the OtterCares Foundation, OtterBox grows to give back by inspiring kids to change the world through entrepreneurship and philanthropy. To learn more about this mission, visit otterbox.com/givingback. 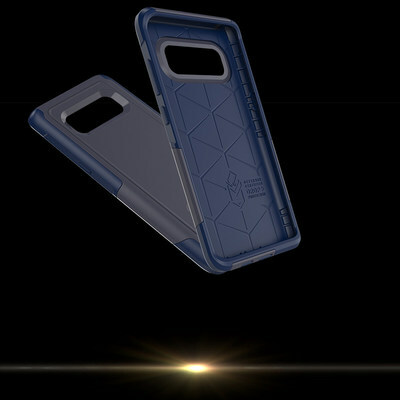 For more information, visit www.otterbox.com. 1 Defender Series, Commuter Series and Symmetry Series are NOT protective against water. Will provide added protection against drops and shock. ©2017 Otter Products, LLC. All rights reserved. OtterBox and all OtterBox logos, trademarks and symbols are the property of Otter Products, LLC. All other logos, trademarks and symbols are the property of their respective owners. Cell Phone Device Protection/Units Sold 9/2014 – 8/2015.